Israel has formally handed over control of the West Bank town of Jericho to the Palestinian Authority. Its troops began dismantling concrete blocks at the main checkpoint earlier on Wednesday and the handover was completed after several hours. Palestinian security forces will now patrol the town, but everyone leaving Jericho will still have to stop at an Israeli checkpoint on the outskirts. A BBC correspondent in Jericho said many residents were unimpressed. Jericho is the first of five West Bank towns to revert to Palestinian control. The others are Tulkarm, Ramallah, Qalqilya and Bethlehem. The deal was reached between Palestinian leader Mahmoud Abbas and Israeli Prime Minister Ariel Sharon at last month's summit in Sharm al-Sheikh. Mr Abbas is now under pressure to get Palestinian militant factions to agree to a formal ceasefire with Israel, and is currently holding talks with all sides in the Egyptian capital, Cairo. 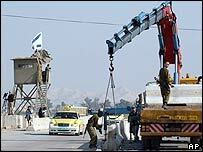 The handover of Jericho was delayed for weeks because of disagreements over Israel's refusal to remove its checkpoint. The formal transfer of control was sealed in a handshake between Palestinian and Israeli officers at a liaison office on the outskirts of the town. A handover protocol was also signed, following a slight delay when Israeli officials sought legal advice before putting pen to paper. "From this moment, we are resuming our control over the Jericho area," Palestinian Gen Ahmed Eid said after shaking hands with his Israeli counterpart. The BBC's Jonny Dymond in Jericho said that apart from one or two Palestinian police cars joining traffic in the main square, life was continuing as normal following the handover. Residents told him that though they welcomed the Israeli move, they were pressing for much more. One said the real issue was the release of Palestinian prisoners. One appeared to be oblivious to what had taken place, asking him, "Why are there so many radio and TV people around?" Jericho's deputy mayor told the BBC that Wednesday's handover was a good start, but the key issue now was to build up trust among Israelis and Palestinians. The full transfer of Jericho and its surrounding area to the Palestinians is to be completed over the next four weeks. Israel occupied the West Bank and Gaza Strip - home to about four million Palestinians - during the 1967 Six-Day War, but they pulled out of most densely-populated areas under the Oslo peace accords. Israeli forces reoccupied all the West Bank in 2002 after a spate of suicide bombings. Correspondents say their raids, checkpoints and travel restrictions have crippled Palestinian social and economic life.